We’re hosting not one but TWO Flip Phone parties in the Mainroom in the coming weeks. Nasty Woman: Night b4 Inauguration happens next Thursday, January 19, and Flip Phone XXL ft. The Very Best of Flip Phone is on Friday, February 3. Ahead of these nights, DJ Fancy Restaurant of Flip Phone tells us a little more about the XXL parties. 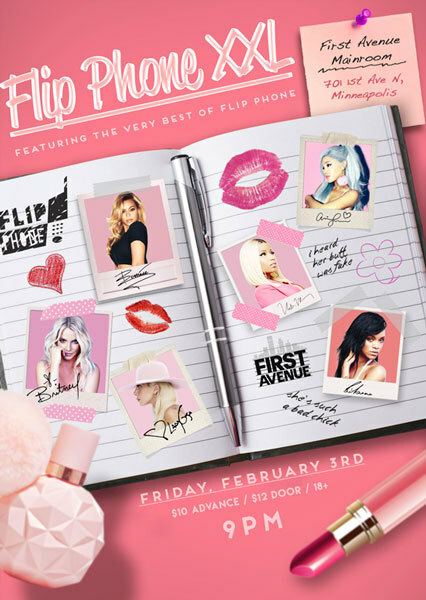 First Avenue: What make Flip Phone XXL parties different than other Flip Phone events? DJ Fancy Restaurant: These parties are definitely bigger! Everything is larger at XXL. The crowds. The drag acts. The sound system. The visuals. It’s like taking one of our smaller parties and multiplying it by five. There really is never a dull moment. FA: Is there a specific theme or musical inspiration that guides each XXL bash? Or is it a mash-up? FR: We take our most popular Flip Phone tribute parties and combine them to make one big bash. The artists we highlight make some of the best dance pop music out there. We like to pair them together to make a night of unstoppable diva hits. FA: What is your favorite part of throwing XXL parties? FR: The crowds! We get a great mix of all different types of people who want to come out and dance. they are fierce and fun! We created Flip Phone because we wanted to create a dance party with non-stop jams. If you come to an XXL, get ready to move.